Who is writing error messages these days at Adobe? Pathetic. 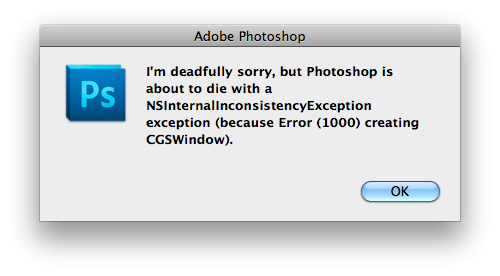 Even better was this message was just so I would know that CS5 was going to crash and there was nothing I could do. Thanks guys. I just had this same message… What does it even mean? It means there is a big difference between technical writers and earthlings. Try dumping your preferences file. I got the same message! “deadfully” I though I actually got some kind of virus on my Mac. I uninstalled PSCS5, DW11, restarted. Reinstalled both apps, ran permissions twice. Both are working fine now. All these crashes occurred after I installed a DMX update. I re-installed the update and so far so good.